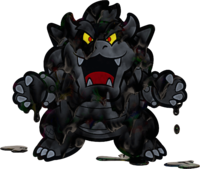 The following is a bestiary for all enemies encountered in Paper Mario: Color Splash, with stats derived from in-game data. Type: The type of enemy. Normal: The enemy is not spiny, flying, or shelled. 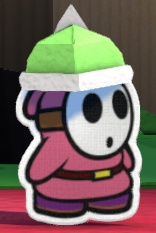 Spiny: If the enemy is spiny, Mario will take damage from Jump attacks against it. Flying: If the enemy is flying, it will dodge any Hammer attacks. Shelled: Lists if the enemy has a shell. Stack: Lists if the enemy is a stack. Strong: The moves the enemy is strong against. Weak: The moves the enemy is weak against. Moves: The enemy's attacks and other techniques. The bold number in the brackets indicates the damage of the attack in HP, the italicized number in the brackets indicates the amount of HP restored with the move. 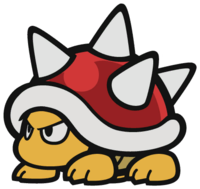 Stomped-on Attack: The attack caused by Mario stomping on the enemy while it is hiding in its shell. It is directed toward the enemies. Line Attack: The attack caused by the enemy bouncing on objects or walls. Group Attack: The attack of the enemy when it is attacking as part of a group (typically happens with groups of three or more enemies that attack together). Blowback Attack: Unknown attack, possibly unused. Location(s): The locations the enemy appears in. Card: Card of the enemy. R: The cards must be won at a Roshambo Temple after the enemy is defeated, a number in place of R indicates the probability that the card is dropped by the enemy. Quotes: Any in-battle dialog spoken by an enemy. Most enemies can have up to four quotes. 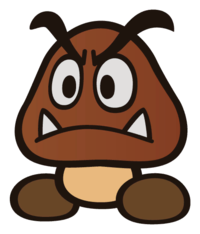 Note: Some of these enemies are variations of a single enemy, are fought in a grouped battle, or have several battles where the enemy has a different stat-spread or form. For convenience, and to reflect the actual data tables of the game, these variations are listed as separate enemies. 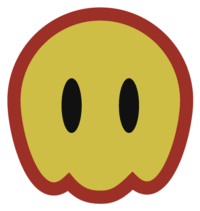 ↑ A transcription of relevant in-game data tables of Paper Mario: Color Splash. This page was last edited on December 22, 2018, at 07:59.